Qwirkle is a tile-based game for 2-4 players, designed by Susan McKinley Ross and published by MindWare. Qwirkle shares some characteristics with the games Rummikub and Scrabble. It is distributed in Canada by game and puzzle company, Outset Media. 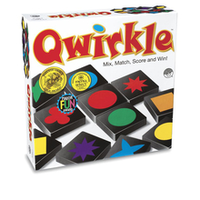 Qwirkle is considered by MindWare to be its most awarded game of all time. In 2011, Qwirkle won the Spiel des Jahres, widely considered the most prestigious award in the board and card game industry. A sequel, Qwirkle Cubes, was released by Mindware in 2009. Qwirkle comes with 108 wooden tiles, and each tile is painted with one of 6 shapes in one of 6 colors. The box also contains a bag to store the tiles and a rule book. In general, any tiles that are placed in a row must share one attribute (either color or shape), and they must be played in 1 line, although they do not need to touch. Players must always end their turn with 6 tiles in their hand, so if they place tiles during their turn, they draw random tiles to build their hand back up to 6. Players score 1 point for each tile placed within a line, including existing tiles within the line. The idea is to form lines that have each shape of a certain color, or each color of a certain shape. For example: if there are 3 stars placed down on the grid (1 green, 1 blue, and 1 purple), then the player can put down another star that is red, orange or yellow. If a line is completed (this is called a "qwirkle"), then an additional 6 points is added to the player's score. At the end of the game, once there are no more tiles to be drawn to replenish one's hand, the first person to play all of their tiles gains an extra 6 point bonus, at which point the game ends, and the player who has the highest score wins.